Water Forward Plan, Little Free Pantry. 14  W hat’s in Season 20  E dible DIY Buzzworthy Bungalows. 36  E dible Endeavor CBD Explained. 40  S potlight on Local Home Growers Give Back. 42  E dible Gardens Olive Trees. 50  E dible Ink Eat Your Flippin' Pancakes. Honeycomb in its frame from Two Hives Honey (page 24). Photography by Melanie Grizzel. food and restaurant marketing these days. ers, it's also usually the place that’s going to appreciate talking to customers about the locally made items that were just picked up, or recalling recent conversations with local farmers. sans, and will hopefully inspire you, too (page 29). Edible Austin Mission To transform the way Central Texans eat by connecting them to the local food growers, producers and makers, thereby strengthening the local food economy and creating a sustainable local food system. 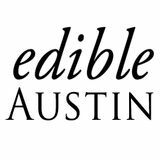 Edible Austin is a locally owned media company and the authority on the local food scene as captured in print and digital and through our community events. 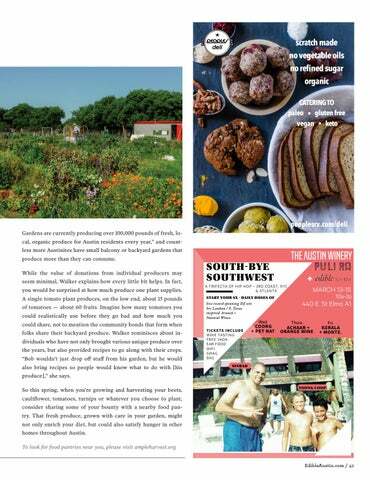 Edible Austin is published bimonthly by Edible Austin L.L.C. All rights reserved. No part of this publication may be used without written permission of the publisher. ©2019. Every effort is made to avoid errors, misspellings and omissions. If, however, an error comes to your attention, please accept our sincere apologies and notify us. 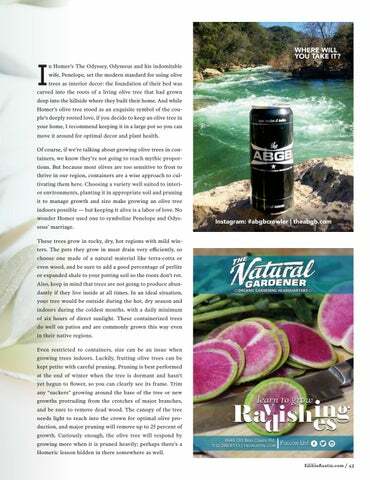 Whatâ&#x20AC;&#x2122;s New at EdibleAustin.com Looking for the perfect seasonal recipe or a new eatery to try? Follow our Pinterest page for fresh spots to explore, in-season dishes and local gift ideas! Looking for a Farmers Market? the beer-to-go push by the Texas Craft Brewers Guild. farm stands on our site for every day of the week. 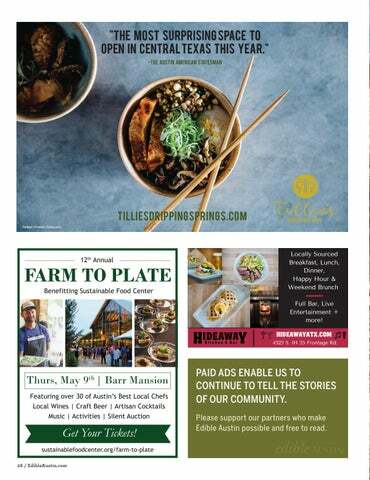 Follow along on social media, our website and through the print magazine for everything you need to know about our local food scene. Giveaways and Deals! Sign up for our newsletter today and get weekly emails with deals, giveaways and up-to-date news delivered to your inbox. EDIBLES IN THE WILD Tag us with #myedibleaustin for a chance to see your photo here. ened water restrictions were in place. Conversely, those of us who experienced last year’s heavy rains and flooding, and the subsequent boil-water notice, will not soon forget that, either. on climate change, population growth and conservation methods. boil-water notice, it was in development for over three years prior. ORDER ONLINE! Now 4 Locations! located at public establishments, Lorraine says there is enough foot traffic by her home to keep it both stocked and utilized. “There are days when it’s filled with baked goods. Today it’s filled with clothing and baby items,” she says. “It’s just really cool to watch … I guess it’s like my way of paying it forward. And the neighborhood loves it. You know, everybody’s always donating.” Though the pantries aren’t large enough to come close to replacing institutions like food banks, they are a fun, unique way to serve both neighbors and those in need. ½ oz. simple syrup 1½ oz. local vodka ¾ oz. Paula’s Texas Lemon ¼ oz. fresh lime juice In the bottom of a mixing glass, muddle strawberries and simple syrup. Add the rest of the ingredients and ice. Shake vigorously for 20 to 30 seconds. Strain into a chilled cocktail glass or serve over ice in a small rocks glass. Garnish with a lemon twist. with a big smile — like a good witch casting a spell. you ferment it,” says Jen. So, she thought, why not do that with cracker dough? 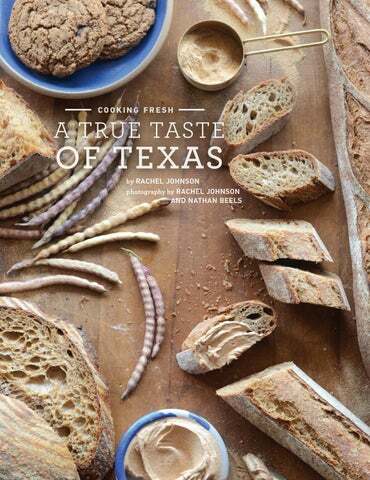 Another winning factor is the dough’s short list of high-quality ingredients: flour from Texas-grown, stone-milled heirloom wheat, salt, water and olive oil (which makes them vegan). They’re really that simple. once baked are, well, “addictive” is putting it lightly. dients, all of which are recognizable. breaks at the market, and handles anything else that comes up. And he’s just as busy as Jen. thing, sun-dried tomato and herb, and za’atar (a Middle Eastern spice mixture inspired by Danny’s Lebanese heritage), is in on the joke. doesn’t cause inflammation,” Jen explains. another, “it is crackers all the time,” says Jen. could do this if they wanted to,” says Danny. The scary part is taking the leap, something they credit their fellow farmers market vendors with inspiring them to do. Danny may be right, but there’s no denying that he and Jen have an ideal combination of skills and a unique passion for sourdough’s strange magic. *Italian Wine Sale runs 4/1/19-4/20/19. Discount off regular priced 750ml bottles of Italian wine. Some exclusions apply. Must be 21+ to participate. Please drink responsibly. Vote Now! Celebrate your community and vote for your food heroes now! Visit edibleaustin.com/hero to vote for the following categories. simple, making your own bee nest. And it’s a very satisfying thing as well. foraging her own food, building her own nest and rearing her brood alone. Because they have no hives to defend, they are quite docile and are unlikely to sting anyone. According to Matthew Shepherd, an expert on pollinators at the Xerces Society (a nonprofit environmental organization dedicated to conserving invertebrates), about 30 percent of native bees, including mason bees and leafcutter bees, are solitary and nest in small, premade tunnels. Perhaps you’ve seen man-made varieties of these tunneled bee homes around Austin. Two Hives Honey sells a version using natural reeds to provide housing for the bees, while many gardeners will make their own bee habitats by drilling holes into blocks of wood. Located in Historic Downtown Buda 308 South Main Street At Buda Mill & Grain Co.
•	Once the bees have emerged, clean out drilled holes or replace the tubes yearly to keep the house healthy. yard for the 70 percent of native bees who nest in the ground. And — just to drive it home one last time — gardening with native plants is always beneficial to the bees. asking to purchase her honey. That moment changed everything. beekeeping quickly became her obsession, and then her job. 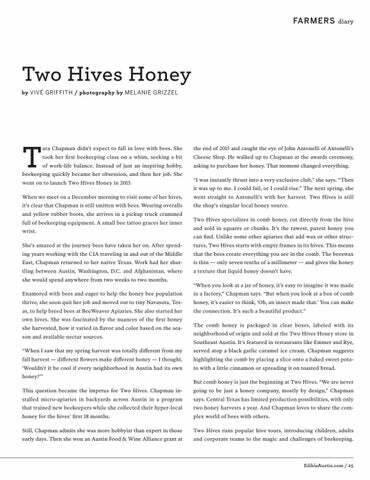 She went on to launch Two Hives Honey in 2015.
the shop’s singular local honey source. and yellow rubber boots, she arrives in a pickup truck crammed full of beekeeping equipment. A small bee tattoo graces her inner wrist. a texture that liquid honey doesn’t have. she would spend anywhere from two weeks to two months. own hives. She was fascinated by the nuances of the first honey she harvested, how it varied in flavor and color based on the season and available nectar sources. to with a little cinnamon or spreading it on toasted bread. honey for the hives' first 18 months. plex world of bees with others. 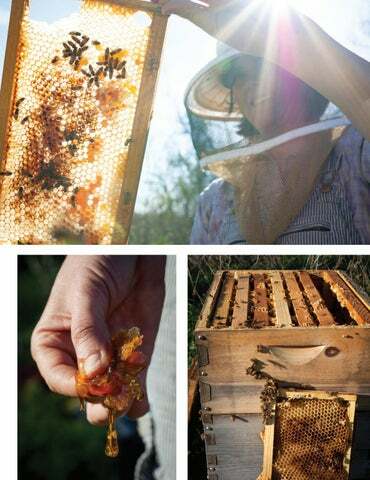 and corporate teams to the magic and challenges of beekeeping. drone on another, as she closely monitors the activity in each hive. Lavender Vendors ~ Lavender Luncheons Live Music ~ Lavender Cooking Demos Concessions ~ Wine Tasting Parking Fee: $5 Admission: Complimentary Hours: Saturday, 10 a.m. – 6 p.m. Sunday, Noon – 5 p.m.
www.beckervineyards.com 830-644-2681 Directions: 11 miles east of Fredericksburg, 3 miles west of Stonewall, off US Hwy 290 at Jenschke Lane. We’re excited to announce the imminent release of our first aged bourbon whiskey. Distilled with 100% local Texas-grown corn, rye and barley. Spring 2019 Visit the distillery to reserve a bottle of our ﬁrst release. Quantities limited. STILL AUSTIN WHISKEY CO. 440F East St. Elmo Road Austin, TX 78745 (512) 276-2700 Support Local. Drink Responsible. Locally Sourced Breakfast, Lunch, Dinner, Happy Hour & Weekend Brunch Full Bar, Live Entertainment + more! HideawayATX.com 4323 S. IH 35 Frontage Rd. PAID ADS ENABLE US TO CONTINUE TO TELL THE STORIES OF OUR COMMUNITY. 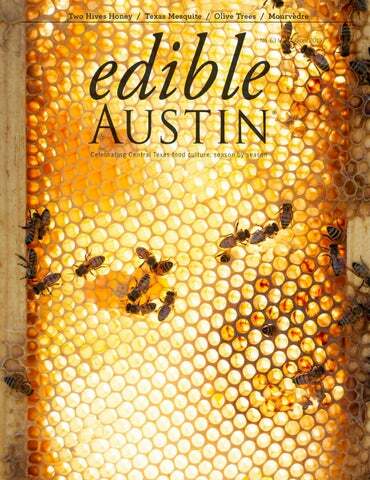 Please support our partners who make Edible Austin possible and free to read. ¼ c. mesquite flour 1 c.
the bottom isn’t getting too dark. dough should slowly spring back and almost fill in the depression. and bake another 10–20 minutes until it’s very dark in some areas. crisp as it cools), and the color should be a dark brown. with a rubber spatula until it comes together into a ball. into a 4-inch disk. Wrap in plastic, and refrigerate for 2 hours. Roll each disk into a 12–13-inch round. Place in a 9–10-inch pie tin, and cut a 1-inch overhang with scissors. Fold the overhang underneath to form a rolled edge, and crimp as desired. Refrigerate for at least an hour before proceeding. I recommend blind baking the crust so it holds up to the filling. Line the crust with a sheet of foil large enough to form a skirt over the edges to prevent burning. Weigh down the foil with pie weights or salt or sugar filled to the brim and packed against the crust. Preheat oven to 350°, and blind bake the crust for 1 hour. butter in a covered bowl or plastic container, and store in the refrigerator. Still interested in learning more? Find mesquite products and learn more about this movement by following @txmesquite on Instagram. sis, intense chronic pain and even cancer. mal experience every parent desires for their children, the father begins to give his son small doses of CBD, having heard about the hemp-based oil’s potential effects on neurological disorders. In two days, the son’s twitches have quelled and he is able to start school with his classmates. suffering from chronic pain, anxiety, insomnia and a laundry list of conditions. unique, and therefore each person will respond differently. ARE YOU TRULY HAPPY INSIDE? GET THE POWER OF 3-IN-1 Prebiotics, probiotics, and fiber* all in one delicious cereal to help support digestive wellness. 1. Launch your camera. 2. Point it at the QR code. 3. Scan and Start your Gut Check! *Contains 4-8g total fat. See nutrition information for total fat and saturated fat content. ®, TM, © 2019 Kellogg NA Co.
“We all have cannabinoid receptors in our bodies. Some people may naturally produce more cannabinoids than others and can take lower doses,” she says. “Some people’s receptors are hypersensitive, feeling the effects of relief almost immediately. Others may not feel anything.” Another local purveyor of CBD-infused goods is Bee Delightful, the creator of Canna Bees honey. Co-founder Seth Nyer is quick to ease concerns about any addictive or harmful qualities CBD may possess. “In 2017, the World Health Organization deemed that CBD does not appear to have abuse potential or cause harm, so at the very least it is harmless,” he says. Bee Delightful aims to lead the path in representing CBD as a food and, pairing two missions of wellness and bee restoration, their Rescue Blend infuses pure CBD extract in raw honey sourced from their bee sanctuaries in Central Texas. Preston Day is the head chef in charge of creating their CBD-infused nourishment. To celebrate reaching their goal of rescuing one million bees in their first year, the team held a lavish dinner party where Day prepared six courses of gourmet, CBD-infused dishes, piloting a program they call Cooking with Canna Bees. Nyer explains that this is not just for show. “Our organs love raw honey, and there is an entourage effect when you pair the two together.” Honey, he claims, is as friendly as possible to our bodies, is easier for moms to give to kids and is more inconspicuous to take. “It’s as simple as a spoonful of honey.” Those desiring even more CBD knowledge can turn to Peoples Rx, the beloved local pharmacy that has been on the frontier of introducing CBD in Austin. They have a dozen different CBD products on their shelves in a range of dosages and formats, from honey, lozenges and chocolates to oils, balms and salves. The staff at Peoples Rx receive regular trainings on the products they sell, ensuring they can help each customer identify the right product. Customers can also be assured that Peoples Rx is sourcing high quality CBD. “We have undergone extensive testing and only accept companies that can provide a Certificate of Analysis detailing the amount of THC and the sourcing of their CBD,” explains Lindsey Wilder Flatt, a wellness specialist for Peoples Rx and an acupuncturist in training. basic understanding of CBD and a general excitement about it. new world of healing is sure to open up. CHA RCU TER IE A ND MOR E! We'' make your home minty fresh We send the same cleaner to your home each time, pay them a high living wage, and train them in the art of cleaning with Miele HEPA-filtered vacuums and therapeutic-grade essential oil cleaning products. Free estimates and $20 off ďŹ rst clean just mention this ad. 512-659-9633 | EcoMamaCleaning.com NOW AVAILABLE IN CANS. duce is always on every list, so it runs out fast. That’s where home gardeners and community gardens can help. old, foot-tall tree will typically cost somewhere between $25 and $50. your epic dedication and perseverance. Life, like food, should be savored and celebrated. It’s not light — there is so much depth and character — but it expresses where it is from. mourvèdre has become a favorite of Texas winemakers. it is called monastrell, the grape produces deep, spicy red wines and is used as a blending grape in rosé cava. In the Bandol region of France, winemakers use mourvèdre, which can age for decades, to create intense reds as well as light, Provençal rosés. depth of color to the blend. be decanted or aged for a long period to round out the rough edges. Mourvèdre pairs perfectly with grilled game or red meats. Brundrett suggests that there is no better pairing than a cabrito taco and mourvèdre. Now Serving 44 Farms Beef! Scratch Kitchen, Hormone & Antibiotic Free Proteins. The Tuesday preceding Ash Wednesday is widely celebrated as a day of indulgence. Depending on where you are, the day is known as Fat Tuesday or Shrove Tuesday. The tradition of making pancakes on this day began as a mighty fine way to use up butter, milk and eggs before Lent. The Olney, England pancake race has been held on Shrove Tuesday since 1445. Competitors run in an apron and headscarf, while ﬂipping a pancake in a pan. La Chandeleur is celebrated in France on February 2nd with a feast of crêpes. Originally a fertility ritual performed during crop-planting, it is thought that crêpes became associated with La Chandeleur because they look like the sun. According to French superstition, if you hold a coin in one hand and successfully ﬂip a crêpe with the other, you will have a prosperous year. It takes about 40 gallons of sap to make 1 gallon of maple syrup. One maple tree yields 10-15 gallons of sap per season. According to the Oxford English Dictionary, the idiom “ﬂat as a pancake” has been in use since at least 1611. In France, crêpes are often served with just a squeeze of lemon and sprinkle of sugar. 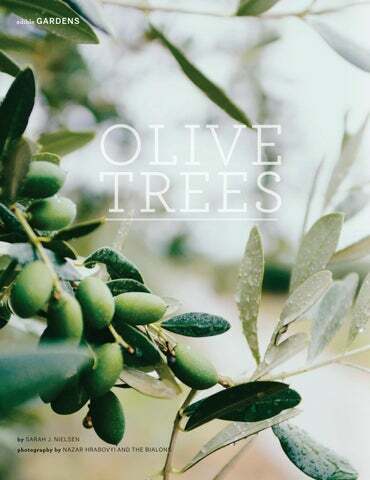 In Homer's The Odyssey, Odysseus and his indomitable wife, Penelope, set the modern standard for using olive trees as interior decor: the foundation of their bed was carved into the roots of a living olive tree that had grown deep into the hillside where they built their home. 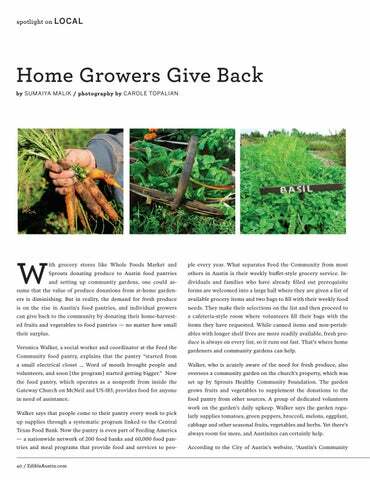 With grocery stores like Whole Foods Market and Sprouts donating produce to Austin food pantries and setting up community gardens, one could assume that the value of produce donations from at-home gardeners is diminishing. If there's one flavor that truly embodies the spirit of Texas, mesquite just might be it. A native, drought-resistant crop, the mesquite tree serves as a source of firewood, smoking chips, pods and beans that have taken on new, innovative culinary applications. Tara Chapman didn't expect to fall in love with bees. She took her first beekeeping class on a whim, seeking a bit of work-life balance.